Making its way into the gaming chair arena is the Corsair T1 Race Gaming Chair with a pretty high back. Is it worth its weight and worth the price tag? Well, we were a little intrigued by the glowing reviews the chair has been receiving and we were also a little intrigued by the outstanding design the Corsair chair offers. It’s a bit futuristic and some of the design of the Corsair chair almost looks like it’s something that could be printed onto a luxury leather car seat. We dove into this chair as explored the exciting features that Corsair had in store for this chair. We could seriously not get enough of this chair. I, myself had spent at least a couple of days’ worth of hours in this thing. The comfort is astronomical, and as ashamed as I am to say it, It did get me daydreaming about cruising around in an actual GT car – while I was supposed to be working. I’m a big fan of the low cushioning zone on this chair. It’s got just the right amount of softness to counter the rock-solid build of the backrest. Even without the lumbar support cushion, you could sink into this baby and ride it all the way to snooze-land. The Corsair chair's design is something almost out of a movie but we think that’s because of their direction in the stitch job they’ve done. As you can see in the middle of the chair, it’s stitched up to look like something that’s from a luxury car with nice leather but on the outer edges of the Corsair chair, it almost looks like a racing seat or something from the future. Maybe it’s a conflict of interest or the color scheme in the particular model we’re looking at but it’s a well done and well thought out design overall. There is a practical purpose to the stitching, as well. Boxed stitching does a great job at keeping the padding from moving around which makes it lumpy after a while. Padding stays where it is supposed to stay and won't end up compressed and uncomfortable after a while. Along with being able to tilt way back to 180 degrees, there’s one area of expertise that Corsair always strives in and that’s the durability of their products. You should never for a minute doubt or consider the possibility that this Corsair gaming chair will go bad on you. The race gaming chair may not be what they’re known for but the overall durability of this Corsair chair is well done and it could possibly be the last chair you ever own. Okay, that might be stretching it a bit but still, it’s pretty durable. 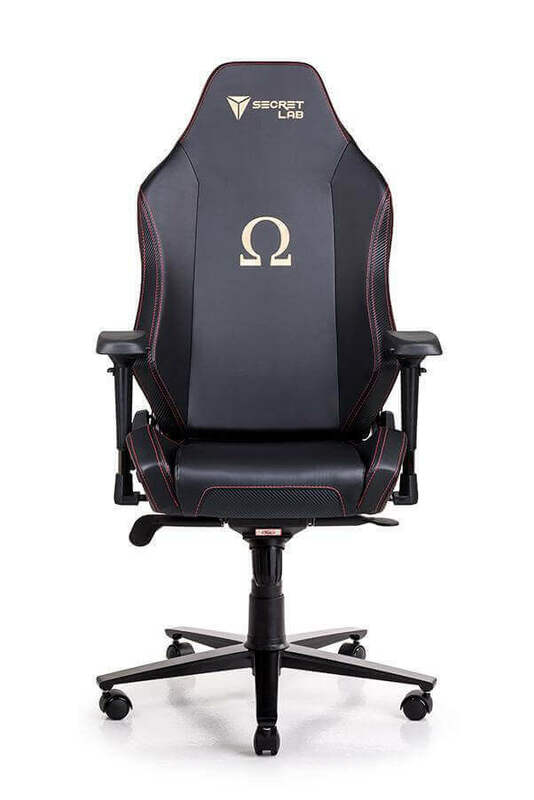 Corsair makes pretty high-quality products but they don’t have an abundance of corsair gaming chairs, so it’s hard to get a hold of this one. Recline Tilt – Something that a lot of people take for granted and don’t give enough credit for is the tilt functionality in corsair gaming chairs. From our experience, people have different levels of comfort and some people like to only have a low degree of tilt backward and some people like to recline fully up to 180 degrees. Well, while we can’t possibly see how that’s comfortable, this chair allows you to recline all the way up to 180 degrees from a starting position of 90 degrees and it will lock in place once you find a comfortable position. Support Pillows Free – The support pillows, which are pretty common in today’s gaming chairs (the lumbar and the headrest) are included for free. Why are these pillows important? Not only for your comfort but for your overall health if you spend a lot of time on the computer. They help promote healthy blood flow, they help you relax and they’re far more comfortable to lay on than your standard headrest cushions. They are covered in microfiber to be comfortable as well as supportive. They are removable if you are more comfortable without them. Movable Armrests – The armrests are equipped with a 4D direction adjustment joint which allows you to do just about anything with the armrests. You can flip them down, move them to the side or do whatever you like that helps you feel more convenient and more comfortable in the chair. Some people like armrests and some prefer to hide them, pretending like they aren’t on the Corsair chair. Larger gamers will like the fact they can set the armrests away from their body in case it is a tight fit. And they can be set as low or as high as you like, ideal for gamers of any height. Heavy Duty Wheels – The wheels on the base of the chair and the skeletal frame are made out of nylon. These nylon wheels are durable but they’ll stay put when you’re gaming. This means that you don’t have to worry about rolling around and the chair won’t go anywhere while you’re in a stationary position. This also doesn’t mean that the chair is hard to move around because it’s actually relatively easy. Similar to rollerblade wheels, they are a very unique addition. They are very safe on hardwood floors as they are virtually scratch proof. The soft but sturdy nylon means they glide quietly while you are moving around. If you have people downstairs, they won't even hear a sound from your chair. Corsair gaming chairs are developed and shipped from the USA. What’s the weight capacity of this Corsair gamer's chair? We’ve gotten conflicted weight specifications for this Corsair chair but users have reported that the weight capacity is up to 265 pounds, which is perfectly normal for most gamers. Does the Company have a warranty with their Corsair T1 Race Chair? It would be best to contact Corsair directly concerning their warranty or coverage of their gaming chairs because we’re not 100% sure. Corsair normally does honor warranty claims without much of a fuss, but there have been a few reports where customers weren’t able to claim that 2-year warranty due to retailer issues. Corsair does specifically claim that they do honor warranties within America, but sometimes, shipping and retail errors make this quite hard for them to track. This is especially true when you buy your chair from a retailer that isn’t partnered with Corsair to sell the T1 or if Corsair doesn’t directly sell the chair in the country you’re buying it from. The Corsair T1 Race Chair with the high back and the sleek black fresh finish look is a must-have PC gaming chair of 2018. While a bit pricey, it’s not too expensive and it’s something that we feel everyone will enjoy. You can put it in your office, put it in your gaming room or anywhere that you’d like to relax for that matter. 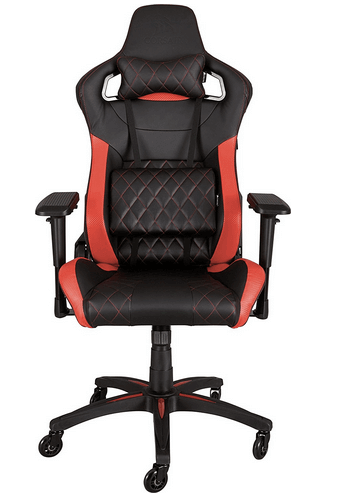 We have no major complaints and neither do the people who have bought this Corsair chair. Little details like the roller blade wheels and the boxed stitching are unique and are additions that elevate this chair above most of its peers.